Tomorrow, the House Committee on Ways and Means will hold a hearing on the distributional effects of 2017’s Tax Cuts and Jobs Act (TCJA). The Joint Committee on Taxation (JCT) has prepared a distributional analysis of the TCJA’s impact, focusing generally on how the TCJA will impact taxpayers in 2019 relative to prior law. The report shows that the TCJA cut taxes for individuals across all income groups, including by more than $500 for almost half of taxpayers. Table 1 from the JCT’s report demonstrates in two ways how the TCJA will reduce taxes for taxpayers in 2019. The column “Change in Federal Taxes” shows that in 2019, the TCJA will reduce aggregate tax liabilities across all income groups by an estimated $259 billion relative to prior law. For example, the group of taxpayers making between $30,000 and $40,000 in 2019 will pay an estimated $5.4 billion less, a 13.5 percent reduction compared to prior law. Aggregate taxes are a combination of individual income taxes, payroll taxes (the employee’s share), excise taxes (attributed to consumers), and corporate income taxes. This also shows that the TCJA will reduce average tax rates for all taxpayers by an estimated 1.7 percent in 2019. The average tax rate is equal to federal taxes (described above) divided by income. 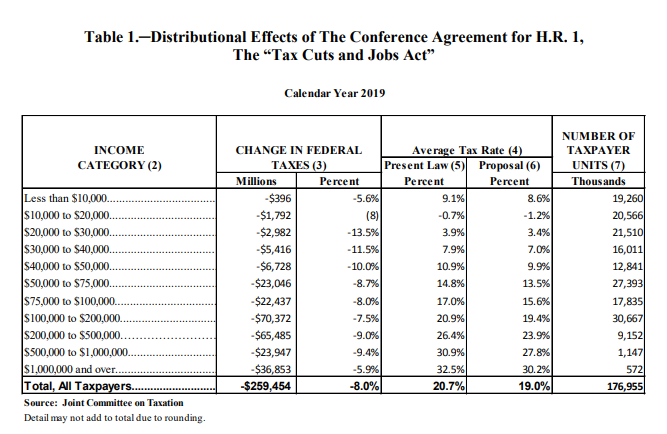 The JCT estimates each group’s average tax rate will be lower in 2019 under the TCJA compared to what it would have been under prior law. The size of this reduction increases with income. For example, the TCJA will lower the average tax rate of taxpayers in the $20,000 to $30,000 income group by 0.5 percentage points and the average tax rate for taxpayers making more than $1 million by 2.3 percentage points. The second table in the report estimates how aggregate tax liabilities will vary among taxpayers within the same income groups in 2019. As the JCT points out, this table “shows that while the majority of tax filers are projected to have reductions in tax liability, some tax filers in each income category are projected to experience tax increases.” This variation occurs as taxpayers will be uniquely affected by changes made by the TCJA, such as the mix of deductions, credits, and exemptions that will be available to a particular taxpayer. However, overall only 5.5 percent of taxpayers are expected to see tax increases in 2019. The TCJA will reduce 2019 tax liabilities by at least $100 for more than 65 percent of taxpayers, and by more than $500 for over 48 percent of taxpayers. The Tax Foundation and other prominent tax policy groups typically focus on the percent change in after-tax income to measure how different proposals impact the distribution of the tax burden. This measure is preferred because it creates an accurate representation of the change in the distribution of the tax burden. Other methods tend to overstate, or understate, the distributional effects of certain policies. Probably the most prominent example of this is measuring the “share of a total tax change.” Using this metric as a guidepost of progressivity and regressivity of a single tax change can imply some odd things about policy. …when looking to see how a tax change impacts the distribution of the tax burden, “percent change in after-tax income” is the most informative. 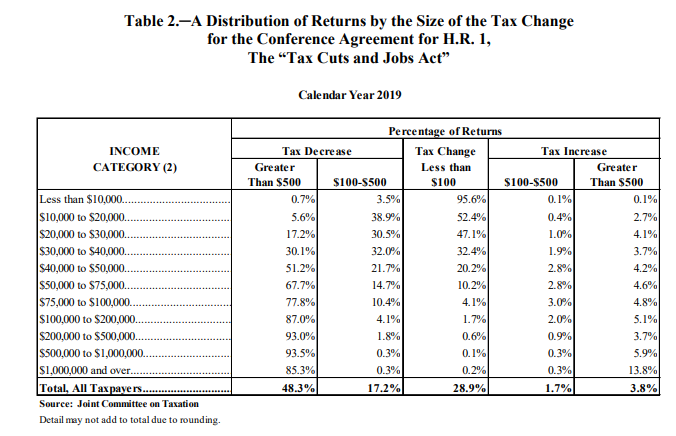 As the Committee debates “The 2017 Tax Law and Who It Left Behind” the JCT’s data provides clear context: on average, the TCJA cut taxes for individuals across all income groups. When considering the total burden of aggregate taxes at the federal level, on average, individuals throughout all income groups will pay less in taxes in 2019 under the TCJA than they would have under prior law.